No updates, amendments to the law or new measures are expected, as unemployment is at a record high and Greece has no reason to regularize or mass legalize illegal immigrants, nor does it have the financial resources to offer amnesty to hundreds of thousands of people. The recession is in its sixth year and is not over. If you are a genuine asylum seeker or refugee, seek free legal advice from the Greek Council of Refugee at gcr.gr. I do not have any knowledge, advice or experience with pink cards or revoked pink cards. Also know in advance that Greece only approves less than 4 percent of all applications for asylum, and illegal immigrants caught by police are kept in abandoned army barracks that Human Rights organizations called unlivable and worse than prison conditions. *Article last updated June 6, 2014. However, please note that ‘Comments’ reflect a specific case or whatever was true at the time. At the end of January, a group of 287 illegal/legal and formerly legal immigrants began a hunger strike in Athens and Thessaloniki that lasted 44 days, during which nearly 200 were hospitalized. The Greek government stated from the beginning it would adhere to EU/Greek laws, not exacerbate the economic crisis and not consent to a mass legalization, nor grant residence/work permits that would only encourage similar protests. c) Lower the ensima requirement to 120-240 from 200-400, dependent on length of permit validity, for all immigrants with several employers in Greece (i.e., housekeepers, child care workers), in order to renew their permit. d) Change law 3907 that says an illegal immigrant may apply for a residence/work permit with special consideration, if proof is provided that he/she has been living in Greece for 12 years, gradually lowering the requirement to eight (8) years over an unspecified period. Though an amendment was drafted by Parliament in August 2011, no time frame for passage of this amendment has been set, announced or published to date. e) Through a customized process by police, grant the 287 hunger strikers a bebaiosi (certificate) of temporary stay for six (6) months, which may be renewed every (6) months. With this bebaiosi, they may continue working in Greece and visit their home countries on humanitarian grounds and return without fear of barred re-entry or penalty. All items in (e) only apply to the 287 hunger strikers, not all undocumented or formerly legal residents in Greece or asylum seekers or refugees. No residence/work permits were issued or approved. No mass legalization was announced. Rumors and racist comments began circulating when BBC published an article that had not been vetted before publication, stating that temporary residence permits were part of the compromise reached. This is not true. An illegal non-EU citizen who has been in Greece since before December 31, 2004 has a right to become legal and secure a residence/work permit if the following documents can be provided to the local municipality. 3. Photocopies of your income tax returns for the past 2 years. – Your annual income must be at least 8,500 euros, plus 15 percent (or 1,275 euros) for each dependent family member (spouse and/or child). i.e. If you are married with 1 child, your income must a minimum of 11,050 euros. 5. Proof that you are currently enrolled with IKA, TEBE or another insurance carrier. 6. Proof of at least 150 ensima per year for the past 3 years. – Originals for verification and photocopies of ensima or a dilosi signed and certified by your carrier. – Immigrants are permitted to purchase all 150 ensima for 1000 euros, but this money is non-refundable if for any reason the permit is never issued. *Note that the normal number is 200 ensima per year. Be aware that you may need an appointment or be required to go early and wait on a first come, first serve basis on certain days of the week when you are ready to submit your papers. A public official will check, verify and bundle your documents in the fakelo, then issue a bebaiosi (blue paper with photo) that you keep to later pick up your permit in 90 days or more. If something is found to be incomplete, it is your responsibility to check with the municipality by inquiring in person (or phone, if you find a rare generous soul); there is no guarantee that anyone will notify you by phone or mail. It takes between 90 days and one (1) year to be issued a permit. You must start the process of renewing your permit at least 60 days in advance of the expiration date or a fine will be assessed. I am writing here following your instructions for asking an emergency question. I am Serbian, living illegally in Greece since May 2005. I have a Latvian (EU) girlfriend living in Greece, and we want to get married. I have to found out what is the best way to exit the Greece and re-enter again, get married and get residence permit. I read everything you have posted about overstaying in Greece. My case is complicated so I will start from the beginning. 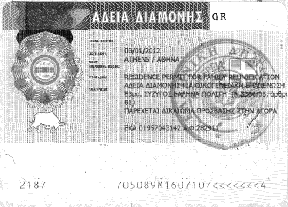 On December 2005 i managed to apply for a Greek residence permit. If I entered Greece before 01. 01. 2005 I will have a full rights for successfully applying for residence permit and a “blue veveosi” until the process is done. But in my case my lawyer managed for me a red veveosi “veveosi katathesis aitisis gia ekdosi adeias diamonis” (it is valid for one month and means i was missing some documents and needed to get them to continue the process for a residence permit). My lawyer managed to push further but after 2 years it was denied by the Periferia Crete. I decide to go to court but i lost the case on May 2007. In the meantime I got an AFM and worked with ensima until October 2007 (some months after I lose the case). My passport will expire on March 12th so there is no more hope for me that I can apply for Greek residence permit in any future legalization of undocumented immigrants, so I think it is the best if I leave Greece in coming days. I still have an old version of a Serbian passport, which is not biometric and requires me to have a visa for traveling. New Serbian passports are biometric and no visa is required for up to 90 days in 180 days for EU. If I want to leave Greece after my passport expires I can still take an document from the Serbian Embassy in Athens, which entitles me to travel to Serbia. I have a two options: to leave Greece the proper way and pay the overstaying fine or to leave Greece (EU) without passing the passport control (it is an option too!)! 1. If I leave Greece paying the fine, get new biometric passport and try to re-enter in Greece probably I can enter but it is still an question will they let me pass the border? I guess you have the same opinion about that?! 2. Do you suggest me first to enter to some other EU country and then to travel to Greece? Which countries do you suggest? 3. If they let me pass the border and I get married, are there still big chances to be refused for Greek residence permit because of my past in Greece? My personal opinion is paying the fine is a better way! 4. Second option is to exit Greece and EU without anybody checking on my passport, so no stamp and no computer, get new biometric passport in Serbia and re-enter Greece. Could I have a problem at the Greece border because of my past in Greece and not having any evidence of me leaving Greece? 5. If everything went well and I enter Greece and get married to my girlfriend and apply for a residence permit, I am afraid I could be questioned about my previous staying in Greece. For example, when I left Greece? For example, why don’t I have an exit stamp? Any risk of getting on black list , even deportation? What is your opinion of all of this? 6. My hope for all those years was one day I will get Greek residence permit in some future legalization of undocumented people. I have information that soon will be new legalization. I just found out that it will not be possible for me to apply for residence permit if I don’t have a valid passport for at least 6 months. that is confusing for me because it means that somebody who is in Greece for 10 years (6 in my case) can’t apply for residence if he/she has expired passport but somebody who is in Greece for 2 years and still have a valid passport can apply for residence if there is legalization for undocumented people. What do you know to tell me about that? I have some 10 days to leave the Greece before my passport expire? I am searching for answers, asked 3 lawyers but I didn’t get clear answers. It will means a lot for me if I can get very soon some answer from you. Also if you can suggest somebody else , maybe some good lawyer? It’s late and it seems I’ll be answering comments tonight instead of doing a new article, so I’ll make this as short as possible. 1. As you already read in “Overstaying a visa in Greece,” there’s no way to know whether they’ll allow you re-entry. Greek authorities are within their right to deny you for overstaying a visa in the past and working illegally in Greece. Paying the fine means you avoid possible blacklisting. 2. Whether you enter through another country is a personal choice as there are no guarantees it will be easier because the SIS computer gives all Schengen countries the same information if they’re connected and if authorities are using them. There’s no way to know if a country or the person passing judgment on you will be more lenient. You must have seen me say this 100 times already. 3. Yes, you can still be denied a residence permit. Marrying an EU citizen doesn’t mean past sins are forgiven. You need to understand that you have done more than overstay a visa. You have been breaking the law by living/working illegally in Greece for almost 6 years. 4. Greek authorities will look for proof of all entries and exits, so do it the right way. I was once not stamped out of the Schengen zone, and Greek authorities asked me to provide proof that I boarded a flight and left before they would even accept an application to renew my residence/work permit. People once criticized me for keeping boarding passes, but in my case it was smart and people ate their words. a) Your entire history of bureaucracy is on file and archived in a database, including what bebaiosis you were issued and when, what applications you submitted anywhere in Greece, what court cases you filed and decisions rendered, etc. b) If you get married and apply for another residence permit, they’ll cross reference that with the rest of your file. c) Since you have a history of overstaying a visa, not having a past permit, challenging a decision in court, working/staying illegally in Greece and a sudden marriage upon re-entry, the immigration committee will automatically (and rightfully) see you as someone who married for a work permit. It doesn’t matter how valid your relationship is. All of it is grounds for denial, and you may be asked to leave. I am a truthteller, not a fortuneteller so I cannot predict what will happen to you. You are responsible for your choices, and all choices have consequences. 6. Legalization is in a rumor, so whatever information you have reflects that. With the economic climate and hunger strikers demanding permits, the ministry has made clear that it will apply the law ‘as is’ and NOT authorize a route legalization for all undocumented workers, repeated again in “Ούτε σκέψη για μαζική νομιμοποίηση μεταναστών” (Not considering mass legalization). It said it MIGHT consider announced Monday in “Μειώνονται τα ένσημα για την ανανέωση της άδειας παραμονής” (SKAI) and “Fewer insurance stamps to renew residence permits” (Kathimerini) that it would be lowering the ensima requirement from 200 to 120 for immigrants who held residence/work permits for years then lost them when they lost their jobs and couldn’t collect enough ensima to renew. Because you never had a residence/work permit, you do not qualify under this scheme. Also, there are far more requirements than a valid passport for 6 months in order to apply for a residence/work permit in Greece. Those here for two years may not qualify, so I don’t see a valid reason for confusion or concern. In my opinion, the lawyers who gave no clear answers without taking your money were honest. Too many promise something without knowing anything, take money and never do anything but give people false hope. I cannot recommend a lawyer to you because I often see them fumbling around in dimosio offices (some don’t even bring a pen and borrow mine) and no lawyer I’ve met is more knowledgeable than I am on permits. It also seems a bit ridiculous that I would recommend you pay someone money but pay me nothing. Leave, renew your passport, try to re-enter and take it from there. Step by step. No lawyer can get around the law. All you can do is follow it. I got married to an EU citizen and had my veveosi. After 1 year, my application for my Greek permit was rejected and a rejection letter was given to me. I want to know if I can apply apply with the new form/law of legalization of people who’s papers had one problem or the other (eg, rejected) at the ministry in syntagma. Do i qualify to apply for this, since I had a family paper but doesn’t pay taxes because I had no job? You did not provide enough information for me to give you a customized answer. However, you need to understand that being married to an EU citizen does not guarantee you or anyone a residence/work permit; there are many lawful requirements. Also there is no mass legalization. Please read the updated article above under “What hunger strikers “won” in March 2011.” Most of the revisions concerned the hunger strikers and those trying to renew a Greek residence/work permit. I entered greece without a passport. On my arrival I then claim assylum asylum and was a granted what they call red paper. After gething getting the red paper i then applied to further my education from the menistry ministry of education and was successful. I was then given a letter of prof proof that confirms I have been accepted a place in one of the greek university with condition that I under go a studies of a greek language at the university of athens and recieve a certificate for the greek language. I then took this course and upon completion of the eight month course I sat to the general exam that was offered in may and was successful in that too, I was issued with the greek language profiency. The following september which was 2011 I enrol to enroll with the university which i am currently under going studies on my first year. Wanting to apply for a resident permit I was told by a lawyer that it is possible because there is law that says that does working with the right ikka IKA and for does studying can apply. I went throw through with the application for a special residence permit since he made it clear to me that i cant get a student permit. Following my application he told me that it will take 4 month for the permit to be out which was last month but it is not. I was wondering what is your thought about this case? I am not in a rush but i just want to see if my application is legit because i have been given a reciete receipt which say that my application for a residence permit does not proof my legality here . In “FAQ: Greek residence and work permits,” it says that permits in Greece can take up to a year — even past their expiration — to be issued in cases where the non-EU citizen is not an asylum seeker. Therefore, four months is not a long time. Asylum seekers with pink (roz) or red cards tell me that they have waited years to hear something on their case. So again, I do not consider four months to be a long time. My opinion is that your lawyer is either not knowledgeable or is knowledgeable and not telling you the truth in order to continue having you as a client. In 14 years, I have never used a lawyer to process any of my papers; I go straight to Greek authorities. I also recommend that asylum seekers and refugees take advantage of free legal services offered at the Greek Council for Refugees in Athens. Visit http://www.gcr.gr for more info. I am non greek, residing here and holding a permit of a red paper. However, I am interested in joining the greek army force or the navy. Please tell me if this possible or not. Secondly I have obtain the greek certificate of language and my friends are telling me that with this i can apply for a greek residence? For your information i have been residing here for 2 years now. I’m fairly certain they will not allow you to join the army or navy because you do not have full legal status. You can use contact information at “Military service in Greece” to confirm. A red paper represents temporary status and does not entitle you to apply for a normal full-status residence permit. You can verify my answer at the Greek Council for Refugees at http://www.gcr.gr and see ‘Contact’ to get their address. Friends are not a reliable source of information. I’m refugees Asylum in Greece, i have Pink Card. 1. How and when i can apply to get Resident Permit ? 2. My husband in U.S of America, he is American, can i apply the procedure to go to America to reunion with my husband ? May i neeed to have Resident Permit before apply to go to U.S of America. I wrote to you yesterday, but you din’t answer me yet ? Can you please check my case ? Thank you for your replying. I thought my question is skipped that’s why i send the second in order to remind you. Thank you in advances for your helping. I said i will waiting from yours. My third comment just an explaination for you to understand why i send to you the second comment. Hope you understand what i mean. It said how many questions were in the queue before you left yours, so the misunderstanding resulted when you didn’t read it. Because I keep count of the questions and I am under no obligation to answer anyone, there is nothing to ‘remind me’ of. Please look at the front page under “Have a Question?” It says there are 130 questions in the queue ahead of you, and I do not work for the government. I am a journalist running this website in my unpaid time. I do not consider less than 24 hours to be a long wait for free assistance. Visit a municipality office if you are impatient for an answer. You cannot apply to be reunited with your husband in America. Why? Because the U.S. citizen must initiate the application, provide proof of income and apply for your visa to bring you into the country. You can read about it at “Green card for a family member.” You should be asking him why he hasn’t done it, not me. Lawyers typically do not know much about laws governing non-EU citizens — which may explain why they plagiarize my website so often — or they know very well, promising hope and solutions to vulnerable persons to trick them out of money. I have never used a lawyer for papers or paid a bribe. Asylum seekers and refugees cannot get married in Greece because red/roz cards denote a temporary status. One must be in a full legal status to marry. If you were somehow granted a marriage license and permitted to marry in spite of this, the red/roz card would again be an issue when applying for his residence/work permit because it would look like he married you for papers and a committee would deny it. I also recommend you consult immigration authorities in your country to see if there’s a different solution that does not involve Greece, perhaps him exiting Greece voluntarily and starting over in yours. Wishing you all the best for health, happiness and finally being together. Please, I hope you can help me. I have a very dear friend in Greece. He is Syrian and went to Greece 7 years ago on a 10-day visa but never left. He has been illegally residing and working in Greece. He has no papers to get out of the country. He is stuck in Greece. He wishes to have a visitor’s visa for either Australia or NZ and then apply for work permit there, then onto residency eventually. How can he get a visitor’s visa to get out of Greece? He is desperate and now that his family has been killed in Syria in the past few months, he has nothing left to keep him near his loved ones. Your advice would be muchly appreciated. Thank you. Here’s the dilemma. Your friend cannot become legal if he is illegal. Applying for a visa to visit another country requires travel documents (passport, etc.) and documentation attesting to one’s stability, usually financial documents, proof of residence, ties to the country he lives. If he’s been illegally living in Greece, I don’t see how he’s going to do that. — Australia may turn him away at passport control because dozens of Greeks are trying to enter the country disguised as tourists to illegally immigrate. They’re being detained and sent back. — When applying to Greece to immigrate as a worker, an employer must sponsor the visa and call for the worker through the Greek embassy/consulate in his country of legal residence (his homeland or a country that issued him a residence/stay permit). A country he’s visiting as a tourist doesn’t qualify. — Electronic records will show he was issued a 10-day visa, but his whereabouts cannot be accounted for after that. If he tells the truth, he’s done. If he can’t produce proof, he’s done. — In order to get a work permit in Greece, there must be a compelling reason to be here. I understand Syria is a terrible place to be and he’s alone now, but this isn’t enough to grant a visa based on work and eventually issue a permit, especially with unemployment now at 25 percent — the highest in the eurozone and still rising. Greece has no reason to import workers when its own citizens and legal immigrants are suffering. He might also ask them if it’s possible to apply for political asylum in a different EU country that will not return him to Greece, as Greece is widely known for its inhumane treatment. i am refugees and i have pink card the did i have right to marry a greek citizen? I’ve answered this question already. Please see the response to ‘Jane’ above. HI. Well first i would like to tell you thank you for what you are doing, and may god help you in what ever you would want to achieve. Pls your help is needed and i would like to help you as much i can also to promote your work. I know nothing about pink cards, as you may have read in comments/questions posted above you by other readers. Therefore, you need to contact people at http://www.gcr.gr and speak with them about your case, the same recommendation I gave to others, not just read the website. There’s no need to pay a lawyer, when GCR offers free legal assistance. Thank you for your offer, but I already have 27K followers, have done my own SEO for almost 7 years and work full time as a web designer/coder/media manager for Fortune 100 companies. My problem is plagiarism and lack of time, as Living in Greece is a philanthropic project. If you come back and tell me what information they gave and what happened in your case, it would indeed give me insight on pink cards and how to help others in a similar situation to yours. Wishing you all the best. No, as it says in the first sentence. This option has been closed since October 2007. Thanks for the wonderful job you’ doing on here. I mean , all the questions I’ve been asking myself have being answered through this your detailed work. You are a genius !! !